Telerik RadRibbonView provides a simple and consistent way for building interfaces similar to the ribbon control used in Microsoft Office. The RadRibbonView may consist of various elements, one of which is the Separator. The Separator is extremely simple element and it allows you to logically separate elements in Application Menu. The class that represents the separator element is Telerik.Windows.Controls.Separator. 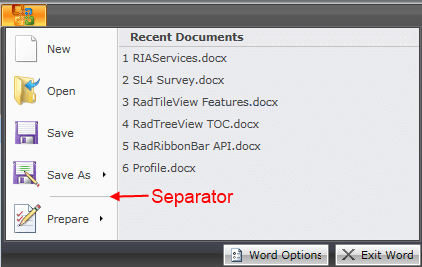 The next example demonstrates how to add a Separator to an ApplicationMenu object.